Do you want to learn how to make the most of your 401(k) retirement plan? Are you looking to find out if (and how) you can invest in recession-proof physical precious metals like gold or silver? You'll find out everything you need to know right here. 401(k) plans as we know them today were not a conscious construct of the United States Government or the Internal Revenue Service. Rather, 401(k)s were the brainchild of benefits consultant Ted Benna. After Section 401(k) of the Internal Revenue Code was added in 1978, Benna realized that the provision could be used to create a simple employee retirement plan with tax advantages. The first 401(k) plans were offered in 1980. Within a decade, nearly 50 million employees had 401(k)s through their employer. Today, nearly 95% of private employers feature a 401(k) option in their benefits package. They are the most popular retirement vehicle in the United States. As a defined contribution plan, a 401(k) is primarily funded through an employee’s pre-tax paycheck deductions. Some employers offer matching programs for individual contributions, but nearly all 401(k) funding responsibility falls upon each individual account holder. Private, for-profit employers are the most likely to have 401(k) plans. Non-profit companies may have similar 403(b) plans, while government employers might offer 457(b) plans. The most important benefit of a 401(k) plan is the possibility of employer match programs, which enable an investor to receive free contributions and exceed standard contribution limits. There are some notable limitations to 401(k)s — notably, investment options are limited to what a plan provider offers. You simply are prohibited from investing in many asset classes through a 401(k), including real estate and precious metals. The vast majority of 401(k) money is put into mutual funds. When you receive funds from your 401(k) for a rollover, you have 60 days to complete the process. If you fail to do this, the IRS will treat your money as a taxable distribution. Additionally, if you are not yet 59 ½ years old, the IRS will also impose a 10% penalty on the withdrawal on top of the normal income taxation. You are limited to one rollover per year from a 401(k) into an IRA. This one-year period begins on the date that you receive your 401(k) distribution. This applies separately to each IRA that you own. You cannot use the cash from your distribution to purchase investments in the period in between receiving your 401(k) distribution and establishing your IRA. It is advised that you select the option to perform a “direct rollover” with your 401(k) funds. In a direct rollover, you never receive a check for your distribution; rather, your 401(k) plan provider will transfer the money directly into you new IRA plan. Here is a table that illustrates how a 401(k) plan compares to other retirement vehicles. In short, this means that you cannot invest in physical gold bullion (or any other precious metal) through a 401(k) Plan. 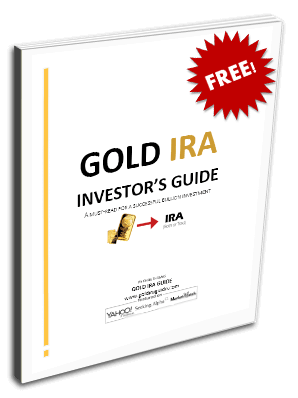 The simplest way to invest in gold through a 401(k) is to purchase stocks in gold mining companies, or to purchase a mutual fund that includes mining company stocks. This is referred to as buying “paper gold.” There are also gold ETFs (GLD) and mining ETFs, which provide indirect access to investing. So-called ‘paper gold’ stocks are the shares of companies that mine, produce and explore for gold. There are literally hundreds of gold stocks to choose from, and the larger companies are listed on major gold stock indices like the Gold Miners Index (GDX) or the BUGS Index (HUI). Gold stocks tend to be more risky than owning physical gold. This is because, historically, gold stocks will appreciate very quickly as the spot price of gold rises; if the price of gold falls, gold stocks tend to fall much faster. Cost of Production Risk – mining equipment depreciation, increased property values and labor costs can all negatively impact a mining company. Management Risk – Mismanaged or overly leveraged companies can and do declare bankruptcy or close shop altogether. Fiat Currency Risk – When you sell securities like gold stock or shares of a gold mutual fund, you will be paid in a fiat currency. In the event of currency collapse, that means you can be left holding worthless paper. The value of physical gold has never hit zero and has retained value for thousands of years. In terms of staying power, physical gold wins hands down. The advantage of rolling over your 401(k) Plan assets into a self-directed IRA is that you are able to control the designation of your retirement funds and open up new tax-free investments – like precious metals. In an employer-funded retirement plan, such as a 401(k), your investment options are more limited than with a precious metals IRA. Additionally, 401(k) plans require the account owner to establish a vesting schedule, which means that you are only entitled to your funds after a certain length of time has passed. In terms of flexibility, the self-directed IRA wins hands down. Additionally, 401(k) plans are vulnerable to the business risks of your employer. If your employer declares bankruptcy or participates in a merger, your 401(k) plan can be changed, frozen, or even discontinued. Gold investments are simple, safe way to diversify your retirement portfolio. Gold (along with other investment metals like silver, platinum and palladium) will help protect your assets against stock market volatility and inflation. Not only is gold a great hedge, but gold offers plenty of growth potential; in fact, many investors purchase gold for its growth prospects alone, and many analysts predict gold to continue to see gains in the future. The total amount of precious metals in your retirement portfolio will depend on your own risk tolerance and retirement horizon. One of the best ways to set up a diversified retirement portfolio – and receive tax benefits on your precious metals investments – is to open a self-directed IRA.